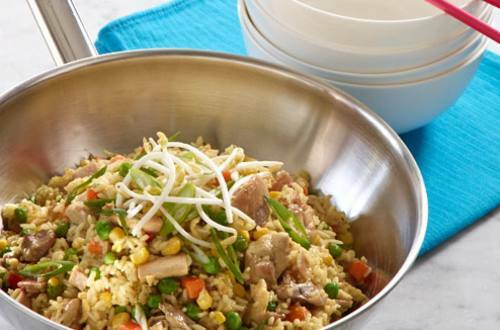 This quick and easy fried rice is a weeknight dinner winner. In less than 30 minutes you’ll have dinner on the table and empty plates in no time. 1 Heat oil in a large frying pan. Brown chicken and bacon. 2 Add Rice and water; stir to combine. Bring to a boil then reduce heat to low. Cover and simmer, without stirring, for 10 minutes. 3 Stir through mixed vegetables. Push rice to edge of pan and pour egg into base of pan. Replace lid and cook for 3-5 minutes until egg is almost set. Break egg into small pieces and stir through rice with the shallots. Top with bean sprouts before serving.